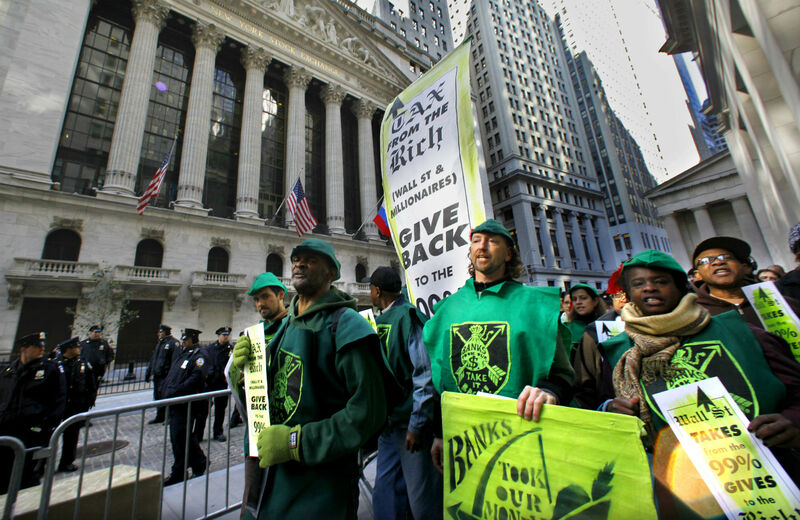 Taxing financial transactions can provide real resources to address income inequality. A lot of people in Washington like to talk about reducing the debt and deficits. Well if you really care about reducing the deficit, how about asking Wall Street speculators to pay their fair share? This bill will add a tax of a fraction of a percent on transactions made by the same Wall Street firms and stock traders who crashed our economy in 2008. This tax alone will generate up to $300 billion a year in revenue, stabilizing the deficit and allowing us to invest in the things that matter—education, roads and bridges, and health care for our seniors and veterans. Unfortunately, that logic tended to be dismissed not just by top Republicans but by top Democrats. With backing from House minority leader Nancy Pelosi, D-California, Maryland Congressman Chris Van Hollen moved Monday to present an “action plan” that is designed to frame the Democratic message in the new Congress. At the heart of it is a proposal to address the rapid redistribution of wealth upward in the United States with a small tax on high-volume stock trades and a new initiative to aid working-class individuals and families. While the numbers may sound big, what Van Hollen has proposed is a modest plan that only begins to explore the potential of a financial transactions tax. The 0.1 percent tax on trades is far below what unions and activist groups have proposed. For instance, Ellison’s 2013 proposal called for a 0.5 percent tax rate on stock trades, along with a 0.1 percent tax rate on bonds and a 0.005 percent tax rate on derivatives or other investments. Of course, any proposal for taxing the wealthiest Americans faces daunting odds in a Congress now wholly controlled by Wall Street–aligned Republicans such as Senate majority leader Mitch McConnell, R-Kentucky, House Speaker John Boehner, R-Ohio, and House Ways and Means Committee chair Paul Ryan, R-Wisconsin. Ryan can, in particular, be counted on to use his powerful new position to defend the financial interests that have so generously supported his campaigns. Yet the decision of the top Democrats in Congress to embrace even a small Robin Hood Tax opens up the debate and provides space for a more serious discussion of income inequality and how to address it. That discussion needs to include not just Democrats who have recently focused on the issue but also the unions such as NNU and the Amalgamated Transit Union, that have significant experience advocating for new approaches to taxation, along with activist groups such as Health GAP and National People’s Action and top economists such as Jeffrey Sachs and Robert Pollin. That asking of politicians is not finished. It is just beginning. While progressive Democrats such as Ellison are on board for a bold approach to financial-transactions taxes, most congressional Democrats are only beginning to explore the prospect. They are taking a tentative step, and that is good. But real progress—in debates with Republicans and in the broader effort to change politics and policies—will only be made if top Democrats come to understand that, in order to address income inequality, America should develop a robust Robin Hood Tax. In this case, it’s an especially good idea to listen to the prescriptions being recommended by the longest and strongest advocates for taxing financial transactions in order to free up resources for human needs. “Nurses see the fallout of the wretched economic policy in the U.S. and globally and see people who have run out of solutions,” says NNU executive director RoseAnn DeMoro, who a number of years ago helped to develop the US campaign for a financial transactions tax. Frustrated with the narrow range of debate about how to find the resources to pay for healthcare, housing, education and so much more, DeMoro and the NNU began educating, organizing and rallying for a Robin Hood Tax.